Toodles & Binks recently set a challenge to use some packaging leftover from Christmas, or something you didn’t want or need, and this is my belated entry. A lot of crafters are now decorating the backs and insides of the cards, and this is my first (poor) attempt at it, but the insert gallery option is playing up, so I’m giving up and not showing that!!!! 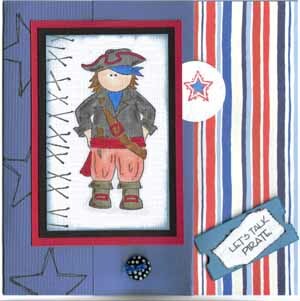 which was a Pirate theme, for National Talk Like a Pirate Day. This is a really quick entry, as dinner is almost ready. a dear colleague at work lot her Dad whilst we were away on holiday, and this is just a quicky sympathy card using SU’s Roses in Winter set. Actually, all apart from the Palette Noir the inks are all SU as well: Elegant Eggplant, Perfect Plum, Pale Plum, Old Olive, Certain Celery and Pretty in Pink. Cardstock is Prism and some white textured from a pack I had on my desk. I stamped a whole sheet of A4 with the design and the cut off as much as I needed. I have a whole piece left to do a birthday card for my friend Karen next week too. Other tools used: Ranger Cut’n’Dry Foam, SU 1 1/4 punch, SU cream note card and envelope and Scor-it board. I just cut the flat off the notecard envie, and then cut one of the notecards in half, and trimmed a little off the side (so it would slide in nicely). I have to say, that until I went to Caz’s Stamp Camp last in July, I’d always passed over this particular set in the catalogue. – I thought it just complete nothingness, and the sample in there too was pants – BUT, it is possibly my most favourite of the whole the current sets available here in the UK. Cut the 12×12 piece of cardstock in half, and score down the middle of one of the pieces to create a 6×6 card. 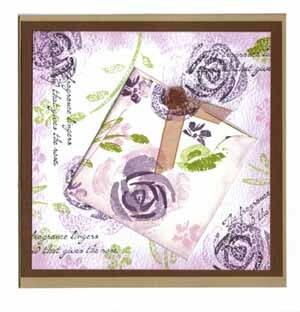 With Palette Noir ink stamp the leaf stem around the card. 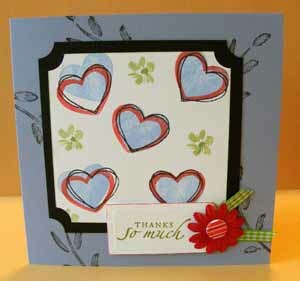 Cut a piece of the white cardstock to 4×4 and stamp the 3-step heart in the Bashful Blue, Red Magic and Palette Noir ink. 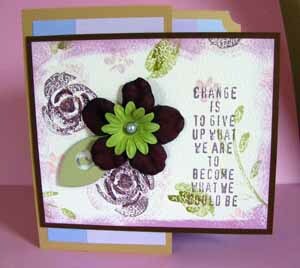 Fill in some of the gaps with the small flower image using Certainly Celery ink. Ticket Punch all four corners. Matt the white piece on to 4.5×4.5 piece of black cardstock and Ticket Punch the Corners. Then position it slightly towards the upper lefthand side of the card (but not too high). With the Wizard machine, and using the middle die, cut out a tag, and edge with the Red Magic dewdrop. Stamp “Thanks so much” in Certainly Celery on this. I used my stamp-a-ma-jig to get the correct placement. Cut a small piece of the green gingham ribbon, and mount underneath where the flower will go. Punch a hole in the tag, and mount the flower (secured with the large brad. 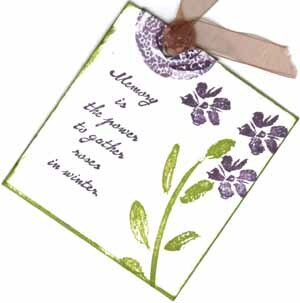 Add Leaf Green Pearlidoodles to the centres of the stamped flowers, and then drop it on the floor to squash them!